FACT CHECK: Was A White Supremacist Invited To The White House A Day After The Midterms? People on Twitter said Wednesday that Patrick Casey, executive director of the white nationalist group Identity Evropa, was invited to the White House after he tweeted photos of himself in front of the building’s south front the day after the midterm elections. “Very fine Nazi invited to Trump’s White House,” Kaili Joy Gray, managing editor at ShareBlue, said in a tweet. 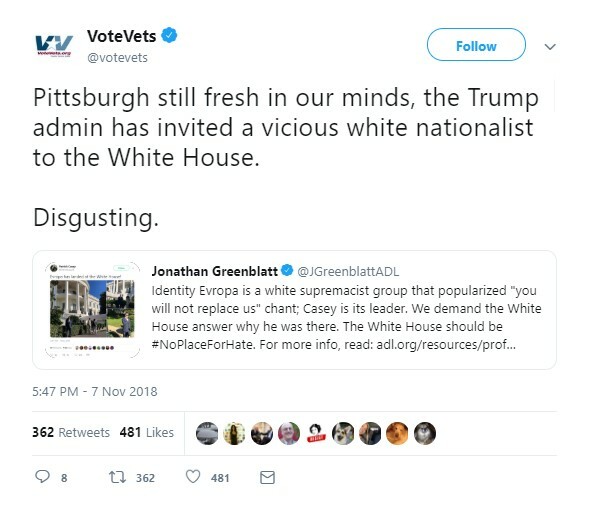 “Pittsburgh still fresh in our minds, the Trump admin has invited a vicious white nationalist to the White House,” liberal group VoteVets said. “So a White nationalist leader is invited to the White House and people are arguing on TV if the President has a team that supports racists?” said Mike Shea, founder of the website Alternative Press. Many other laypeople said that the White House invited a white nationalist after Casey tweeted the photos. Casey visited the White House in October during the fall garden tour, which is open to the public. Casey’s tweet gained traction after PBS News Hour White House correspondent Yamiche Alcindor cited it to defend a question she asked President Donald Trump earlier that day. “That’s such a racist question,” Trump responded. My Q was fair & timely. Jonathan Greenblatt, CEO of the Anti-Defamation League, also publicized Casey’s tweet. “We demand the White House answer why he was there,” he tweeted. The White House Garden Tour allows visitors to “stroll around the White House grounds” twice a year on weekends in the spring and fall. The 2018 Fall Garden Tour took place on the weekend of Oct. 20, more than two weeks before Casey tweeted the photos. Garden tour visitors may snap photos in front of the south front, as Casey did. Casey confirmed to The Daily Caller News Foundation that he obtained tickets to the garden tour himself. He expressed amusement that so many people believed that he was invited to the White House. This couldn’t have turned out more fantastically—the Left, faux-conservatives, and mainstream media all fell for it…just as planned. “This couldn’t have turned out more fantastically–the Left, faux-conservatives, and mainstream media all fell for it…just as planned,” Casey tweeted Wednesday. And for the record, I have no ties, formal or informal, to anyone in the White House. Trump and his administration are civic nationalists, not identitarians; so while I do support the MAGA agenda, there’s no connection between IE and the White House—at least not yet! “And for the record, I have no ties, formal or informal, to anyone in the White House,” Casey clarified. The Daily Beast later updated its story after the White House said that Casey attended the garden tour, and Alcindor noted the White House response in another tweet. VoteVets deleted the tweet following an inquiry from TheDCNF. Gray, VoteVets and Shea did not respond to requests for comment in time for publication.